Your event photos are now available for downloading and sharing. Just enter your event name and click View Photos. If your event took place at the Walt Disney World Resort in Florida and you have any questions, please call 407-827-2530. If your event took place at the Disneyland Resort in California and you have any questions, please call 714-781-6426. CAREFULLY READ THE FOLLOWING TERMS AND CONDITIONS BEFORE USING THIS WEBSITE. with respect to Photo Files of the indoor functions that Client holds within private meeting rooms at a hotel at the WDW Resort, for any private, non-commercial purpose; provided , that none of the Photo Files contain any identifiable image of the WDW Resort or any part thereof; any name, mark, symbol, character or copyrighted material of DEG, The Walt Disney Company or any of their affiliates (collectively "the Disney Companies") or any of its or their respective licensors (including, without limitation, any corporate participants or other sponsors of any of the foregoing); any reference to, or any other materials that may be associated with, any of the Disney Companies or such licensors; or any depiction of or reference to any current or former employee of any of the Disney Companies or such licensors. Client agrees that he/she will not (and will not permit another person or entity to) sell, transfer, or use in any commercial manner (i.e. for the purpose of receiving or facilitating the receipt of financial remuneration or any other consideration), the Photo Files. Client acknowledges and agrees that he/she receives no rights or ownership interest of any type in or with respect to any intellectual property owned by any third party or, except as expressly granted herein, by DEG and its affiliates, displayed in or as part of any Photo Files and that all such rights remain the property of their respective owners. Client may retain one copy of the Photo Files for archival purposes only. DISCLAIMER OF WARRANTIES: DEG MAKES NO WARRANTY OR REPRESENTATION REGARDING THE PHOTO FILES, INCLUDING WARRANTIES FOR MERCHANTABILITY, FITNESS FOR A PARTICULAR PURPOSE, CORRESPONDENCE WITH DESCRIPTION, TITLE AND NON-INFRINGEMENT, ALL OF WHICH ARE EXPRESSLY DISCLAIMED. GOVERNING LAW: This License shall be governed by the laws of the State of Florida. 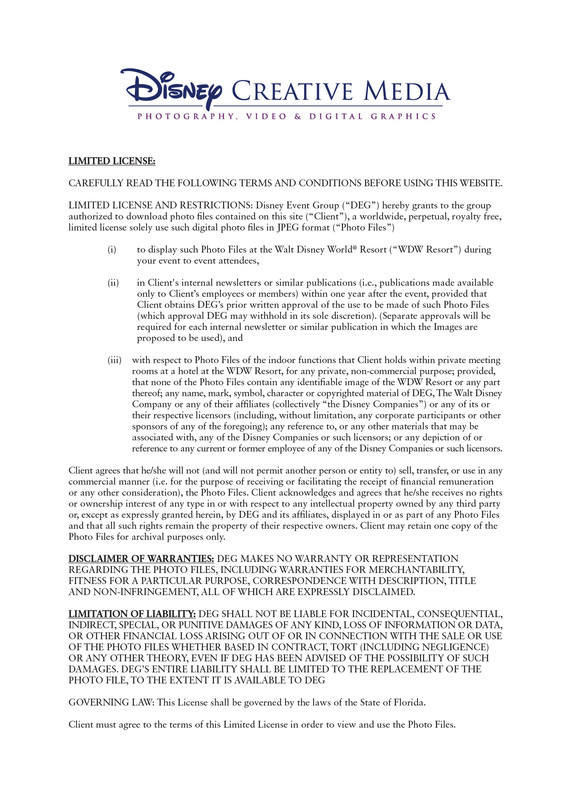 Client must agree to the terms of this Limited License in order to view and use the Photo Files. No images found It can take up to 24 hours for images to be available. Please check the spelling and try again later.